CHAMPAIGN, Illinois, March 5, 2014 — Fans of the late film critic Roger Ebert have helped raise $50,000 to erect a sculpture to honor him in his hometown thanks to a matching grant challenge issued by the Ebert Foundation. Total cash and in-kind donations for the project come to $75,000 — two-thirds of the goal – with $37,500 remaining to be raised. 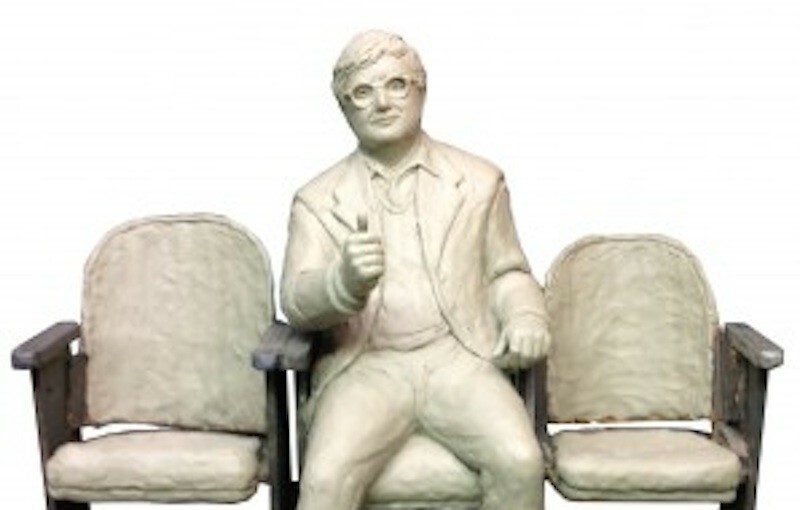 The life-sized bronze sculpture of Ebert sitting in the middle of three theater seats displaying his signature “thumbs up,” will sit outside the Virginia Theatre. The idea was conceived by Donna Anderson, the travel agent for Ebertfest, who moved forward with the project while in the hospital recovering from heart transplant surgery. The artist, Rick Harney of Bloomington, has delivered the models to make the sculpture molds to InBronze Foundry of Mt. Morris. The hope is that the sculpture will be ready to unveil at the Ebertfest film festival April 23-27 in Champaign. Meanwhile, the fundraising committee continues to work on raising the remaining $37,500. “Donor contributions have demonstrated that there are lots of Roger Ebert fans that wish to honor Roger in this manner and are willing to support this project. Now is the time for those on the sidelines to join in and help us get over the top,” Scott Anderson said. Tax-deductible donations can be made to the Community Foundation of East Central Illinois, at 307 W. University Ave., Champaign, Illinois 61820, or online at ebertsculpture.org. Designate gifts for the “Ebert Sculpture.” Donor incentives are listed at http://ebertsculpture.org/donate-now. For further information, contact Scott Anderson Jr. at 217-359-8200, 217-840-8390 (cell), or scottdaref@aol.com.